The Alliance for Clinical Education (ACE) is proud to announce its newest text. 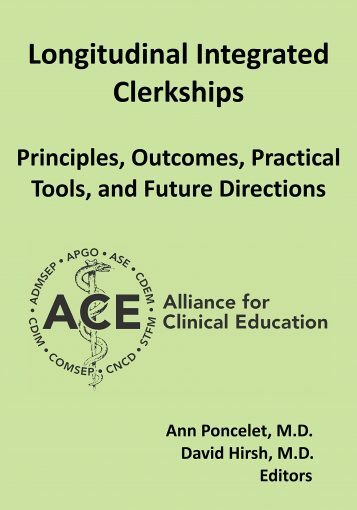 Dr. Poncelet and Dr. Hirsh eagerly developed an encyclopedic chapter for the 4th edition of the ACE Guidebook for Clerkship Directors, and it seemed logical and proper to grow that chapter, which had been truncated for the Guidebook, into this book. They have assembled the leading international experts in the field of the medical school longitudinal integrated curriculum, who in turn have generated what we are sure will be considered the ultimate resource for these experiences. This book fills a significant void in the medical education literature. Starting an LIC is both exciting and challenging. The LIC community is eager to work collaboratively to support those engaging in all LIC endeavors. We encourage you to reach out to the LIC community through the resources listed, blogs and existing literature to help get started. Every LIC is different. Each LIC site draws from the best practices (many of which are available on this website) of educational community and molds this with the rich contexts of location, institution and community. The consistent thread through all LICs (old and new) is the value of student learning through longitudinality, integration and continuity. The resources below are a great start to planning your LIC. Ellaway R, Graves L, Berry S, Myhre D, Cummings B-A, Konkin J. Twelve tips for designing and running longitudinal integrated clerkships. Med Teach [Internet]. 2013 Dec [cited 2016 Mar 9];35(12):989–95.